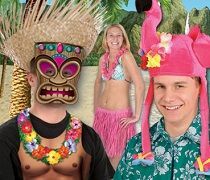 Toss on a fabric lei and start celebrating the summer heat with the hundreds of different bulk luau and beach party decorations that are in stock and ready to ship. We have flamingo decorations, island party props, palm tree centerpieces and so much more! Aloha! from your bulk party headquarters and welcome to your one stop shop for everything Hawaiian and Luau. Get dressed in your Hawaiian swag and start partying. You will find all of the silly flamingo boppers and hats that you need to have a great time at your Island party. Maybe the flamingos are not the direction that you thinking, that's no problem. Party Express has dozens of luau hats to choose from, so you can toss a crab, parrot, or umbrella on your head and waltz around the party. Are you planning on having hundreds of people at your luau party? This is exactly what Party Express specializes in. 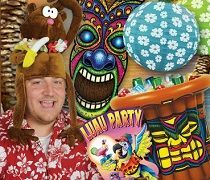 Grab some bulk luau party supplies and decorations and have a luau event of the ages. Do not forget to decorate for your island party. 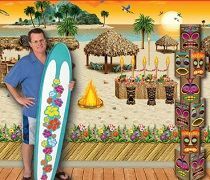 Take a look at the hundreds of bulk luau decorations that we have available. The best approach to decorating is to start with the tables. 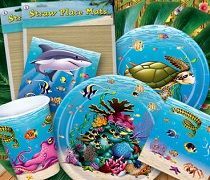 Select your plates, cups, and napkins and then match your luau decorations accordingly. A luau party should be bright like the sun. So grab some bright colored party supplies that remind you of an island oasis in the sun. We have bulk paper lanterns, palm tree centerpieces, tiki bar signs, and so much more. You will make your event space look like a beach bar in the islands by the time you are finished. Even if you are in the middle of a desert your guests will be looking for the ocean by the end of the party.